Lilianne Ploumen is a government minister in the Netherlands. "I was in a position to do something," she says of her decision to start the "She Decides" initiative. At a conference in Brussels on Thursday, more than a dozen nations and private funders pledged a combined total of $190 million for international family planning charities that stand to lose their U.S. support as a result of President Trump's Jan. 23 executive action to block U.S. foreign aid funding of groups linked to abortion. The policy disqualifies organizations that perform abortions or advocate for the procedure's legalization, as well as those that provide patients with basic information about abortion or medical referrals to obtain the procedure. "The President, it's no secret, has made it very clear that he's a pro-life president," White House Press Secretary Sean Spicer told reporters shortly after the Trump action. "And I think the reinstatement of this policy is not just something that echoes that value but respects taxpayer funding as well." For all its size and scope, the fundraising effort was the brainchild of one woman: Lilianne Ploumen, a Dutch government official who came up with the idea just a few weeks ago, shortly after Trump enacted the measure. The policy has been adopted by each Republican president since Ronald Reagan, and reversed by Democratic presidents Bill Clinton and Barack Obama. Still, Ploumen says she was surprised that Trump re-instated it. "I was very disappointed. I did have some hopes that he might decide differently," she says. But then, adds Ploumen, she realized that as the Netherlands' Minister of Foreign Trade and Development Cooperation, "I was in a position to do something." She dubbed the replacement fund the "She Decides Initiative" and set about recruiting partners in other governments. Ministers of three other nations — Belgium, Denmark, and Sweden — soon signed on to co-sponsor the conference in Brussels. As a self-identified Catholic — "I do go to church, though not every week," Ploumen says — she might seem an unusual champion of this cause. Several Catholic organizations are among the staunchest supporters of the U.S. funding ban, arguing that it's the only way to ensure that U.S. tax dollars don't go toward supporting abortions overseas. "Without the Mexico City Policy in place, the U.S. is ... exporting the destruction of life as a solution to challenges faced by families in developing countries," Deirdre McQuade, a spokeswoman for the U.S. Conference of Catholic Bishops told NPR shortly after Trump's election. "Poor women in developing nations don't want help aborting their children. They're calling for food, clean water, housing, education and medicine for their families." Ploumen counters that her Catholic faith is actually what drives her commitment to the effort. "We were taught that your faith helps you to develop your own conscience and to make your own decisions," she says. "But in order to be able to do so you have information and you have to know what your options are, so that you can weigh them according to your values." And like other opponents of the funding ban, Ploumen argues it will prove counterproductive by resulting in more unwanted pregnancies and unsafe abortions. 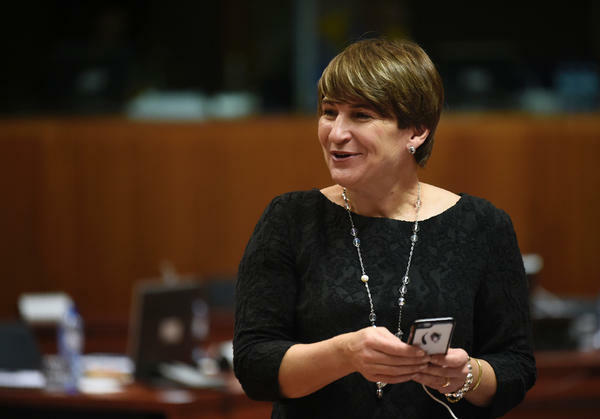 Drumming up funds for a feminist cause is a familiar role for Ploumen. From the mid-1990s through 2001 she headed an organization called Mama Cash whose mission is to raise money for groups that support women's rights. During her tenure there says, Ploumen, "it was not so easy to get support for the movement." By contrast, she says, the swift response to the She Decides fund has been "heartening." Among the funders that formally announced their contributions today are the governments of nine European countries, Australia, Canada and private parties such as the Gates Foundation (which is a funder of NPR). The largest single grant came from an anonymous U.S.-based donor: $50 million. Still the grand total of nearly $200 million represents less than a third of the roughly $600 million in U.S. family planning funding potentially at stake. And the amount may actually be much higher because Trump's version of the policy is more expansive — applying to spending by all global health groups and not just not just monies explicitly earmarked for family planning groups. Ploumen says she hopes not just other countries, but more non-profit groups and even individuals will step up to fill the gap in the coming weeks and months. "This is only the beginning," she says. "And governments can't do it alone."